AOR™ guarantees that all ingredients have been declared on the label. Contains no wheat, gluten, corn, nuts, peanuts, sesame seeds, sulphites, mustard, soy, dairy, eggs or fish. 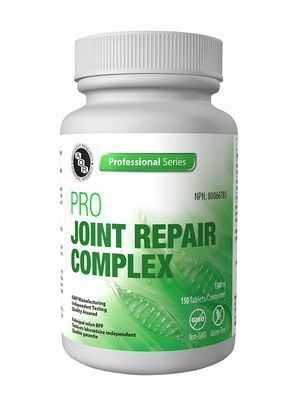 This powerful triple-action joint repair formula combines three well-known and effective nutrients for joint health: MSM, glucosamine, and chondroitin. Glucosamine and chondroitin are two components of joint cartilage and supporting tissue, while MSM, or methylsulfonylmethane is a naturally-occurring form of organic sulfur found in living organisms. In humans, sulfur is present throughout the body and is used for a number of different processes. The main purpose of glucosamine and chondroitin is to provide structural support for joint cartilage. Chondroitin provides resistance against compression, while glucosamine provides support for both the cartilage and the synovial fluid surrounding the joints. This helps cushion the joint and reduce friction, which is beneficial in reducing osteoarthritis symptoms such as pain and joint damage. MSM can reduce the symptoms of knee pain and improve mobility in osteoarthritis due to its anti-inflammatory and connective tissue supporting benefits. This is also beneficial for highly active individuals. This exclusive formula for healthcare practitioners combines the most effective nutrients for joint health. Studies show that this combination is more effective than supplementing with glucosamine, chondroitin or MSM alone. These materials are sustainably sourced as by products of meat and fishing industries. Adult Dosage: Take 3 tablets daily with/without food. Use for a minimum of four weeks to see beneficial effects.